SELinux provides a safer system through the powerful concept of mandatory access controls. Linux is an extremely safe operating system, but legacy access privileges provide no protection against misconfiguration or badly programmed software. If a program runs haywire because the administrator has forgotten to install the latest patch, or if a user escalates privileges due to an incorrect setting, the native safety of the system is no protection. SELinux mitigates the potential danger by adding an extra level of access control called the Mandatory Access Control (MAC) level. About seven years ago, the National Security Agency (NSA)  launched the first version of SELinux. Intended as an extension for kernel 2.4 at the time, the kernel patches have since found their way into the official 2.6 kernel. 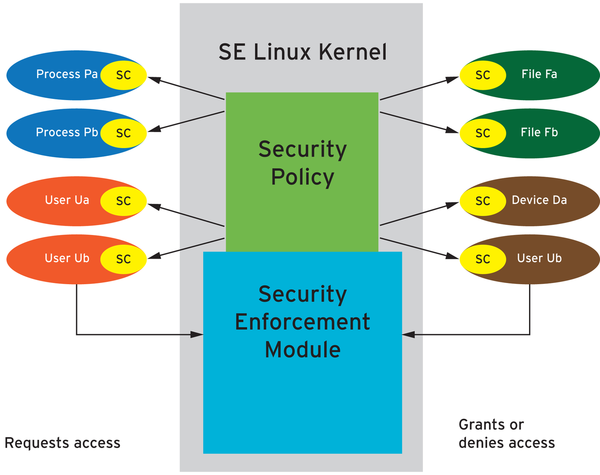 For many distributions, SELinux is part of the standard configuration. The examples introduced in this article are based on the Red Hat community distribution Fedora Core 8, although they are generically valid on any other platform that supports SELinux. The important thing is that the required kernel support (CONFIG_SECURITY_SELINUX) and the libselinux, policycoreutils, and selinux-policy-targeted packages are installed. SELinux also requires a few standard packages (SysV-Init, pam, util-linux, coreutils, and others). The legacy Linux security system is based on Discretionary Access Controls (DACs). This means that the owner of a file has absolute control over the object they have created. If a user inadvertently grants global write access to the file, a separate process that validates this step does not exist. Or, if an attacker manages to execute arbitrary program code on the web server by exploiting a vulnerability in the web server software, the program code – a shell for example – will run with the privileges of a user account the server is running on. If that account is the apache user, the attacker has access to all files that the apache user account can access. In most cases, no process checks whether the web server really needs to access the files that it is accessing to be able to do its chores. An attacker who gains access to the system then may be able to escalate their privileges on the machine. Just recently, many Linux systems were compromised because of a bug in the kernel that allowed attackers to exploit the vmsplice() system call. As a consequence, attackers gained complete control over the whole system. Although SELinux will work on file systems that do not support extended attributes, such as NFS or ISO9660, administrators have to resort to various workarounds to get this to happen. The mount command has an option to handle this: context=<security-label>. This lets you specify a security label for the complete filesystem. The policy is another important component. An SE policy defines access between individual objects and subjects. The policy specifies which objects the process (such as an httpd process with a specific role) is allowed to access. If access is not explicitly permitted, it is initially logged and finally prohibited – at least in enforcing mode. The kernel's security server makes sure that no infringement against the policy occurs. The security server is an entity that references the policy, and the security label defines whether access is permitted. To avoid performance overheads, the kernel-based server uses the Access Vector Cache (AVC). Figure 1: The kernel-based security server decides on the level of access. TE specifies which subject is permitted to access which objects – for example, which process is allowed to access which files. However, a wide variety of different objects exists, including network ports or memory areas. SELinux assigns a domain to each subject and a type to each object. To explain this generically, type enforcement controls which domain is allowed to access which types. Both types and domains are identified in a similar way; they always end with _t (e.g., httpd_t). RBAC uses an abstract user model and assigns each user exactly one role. Users then inherit the privileges assigned to the role. It is thus possible to assign a role to the root user that does not possess any administrative privileges. To change to another role with extended privileges, the user would first need to authenticate with a password. This is an interesting feature if you want to set up the machine without the omnipotent root user. The user can only assume a single role at any given time; however, users can give the newrole command (which is similar to su) to change roles, assuming the policy allows this. A typical role name is user_r (roles always end with _r). Russell Coker offers a couple of SELinux play machines on the network  to allow people to experiment; these machines demonstrate RBAC functionality. Coker has published the root account for these machines, allowing anybody who is interested to log in as the administrator. Testers will soon find out that the command set available to them is extremely restricted, in that the root user is not the administrative user on these play machines. The policy needs a rule that gives the httpd_t domain access to tmp_t type files, but it does not exist. The web server needs to access its own configuration files, CGI scripts, and other content in its directory. Specific types exist for all of these files; for example, httpd_config_t, httpd_log_t, httpd_sys_script_exec_t, and httpd_sys_content_t. Files in the /tmp folder are not typically the kinds of objects the web server accesses; thus, no allow instruction is in the policy file for the tmp_t type. This log entry reveals that the process with PID 6608 and name httpd has just attempted to issue the getattr system call (i.e., it attempted to call the attributes) for a file with inode number 179881 and name index.html. scontext and tcontext refer to the security label for the source process (apache) and the target file (index.html). avc: denied indicates that the security server running in the kernel prevented this action. If you prefer a more structured approach, you can use seaudit to view logfiles (Figure 2); the tool displays individual log entries graphically. 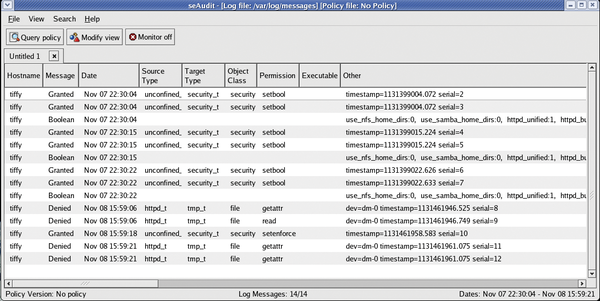 Figure 2: The sedaudit tool displays all the log entries for SELinux in a sorted list. By calling seaudit-report --html logfile, you can even generate an HTML page that displays both the logs and various statistics on the SELinux system (see Figure 3). Figure 3: seaudit-report can generate statistics in HTML. The setroubleshoot demon was developed some time back to make the slightly cryptic messages issued by the audit daemon more readable and to give users tips on resolving problems. If the user issues the command specified in the log entry, they get to see the explanation shown in Listing 1. SELinux is preventing the /usr/sbin/httpd from using potentially  mislabeled files (/var/www/html/index.html). SELinux has denied /usr/sbin/httpd access to potentially mislabeled  file(s) (/var/www/html/index.html). This means that SELinux will  not allow /usr/sbin/httpd to use these files. It is common for users  to edit files in their home directory or tmp directories and then  move (mv) them to system directories. The problem is that the files  end up with the wrong file context which confined applications are  not allowed to access. If you want /usr/sbin/httpd to access this files, you need to relabel  them using restorecon -v /var/www/html/index.html. 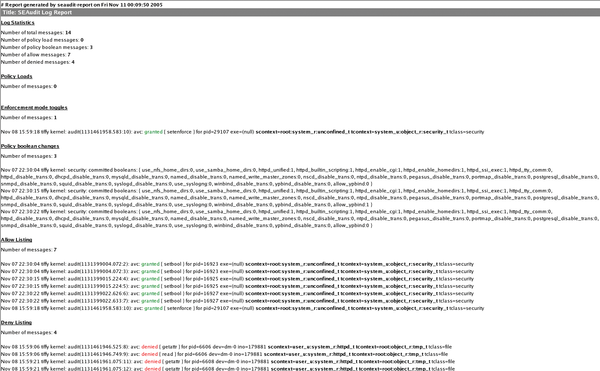 You might want to  relabel the entire directory using restorecon -R -v /var/www/html. The next time somebody tries to display a file in the web browser, there shouldn't be any security obstacles. The example here shows how SELinux works. Independent of legacy privileges, Linux only permits access if a corresponding entry in the SELinux policy exists (MAC). The security-conscious distributor or administrator will only create this entry if access is really necessary. Figure 4: setroubleshootd offers a graphical front end for logs. The security framework SELinux is set to offer a Sandbox in which applications deemed insecure can be partitioned off from other system areas. If you're ready for mandatory access control and you're looking for an alternative to SELinux and AppArmor, try locking down your system with Linux Intrusion Detection System.